The fennel, black pepper and apple really makes this dish. Sweet and spicy. Great as a side dish (halloumi makes for a perfect combo) or as a starter. 5. 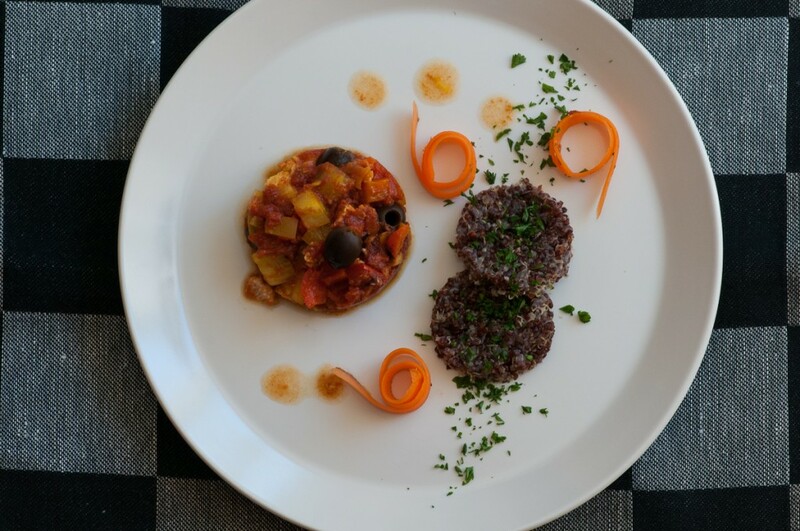 In a mold, place the quinoa on the bottom, then add an equal layer of vegetables on top. Remove the mold. 6. Decorate with sprigs/fronds of fennel, radish sticks and lingonberries. A quick and refreshing addition to the summer buffet. 1. Boil the quinoa with a stock cube according to the instructions on the package. 3. Chill in the refrigerator for a few hours. Zaatar is a wonderful spice mix often used in Middle Eastern cooking. It is based on Sumak (citrus/sour flavoured ground berries) and herbs. 1. Slowly whisk the Zaatar into the olive oil until well blended. Set aside. 2. Cook the quinoa according to the instructions on the package. When cooked, stir in half of the Zaatar dressing. 3. Whisk the ingredients for the Dijon dressing. 4. Combine the beans, onion and tomatoes. Add half of the Dijon dressing. 5. When serving, play with drops of the remainders of the two dressings. 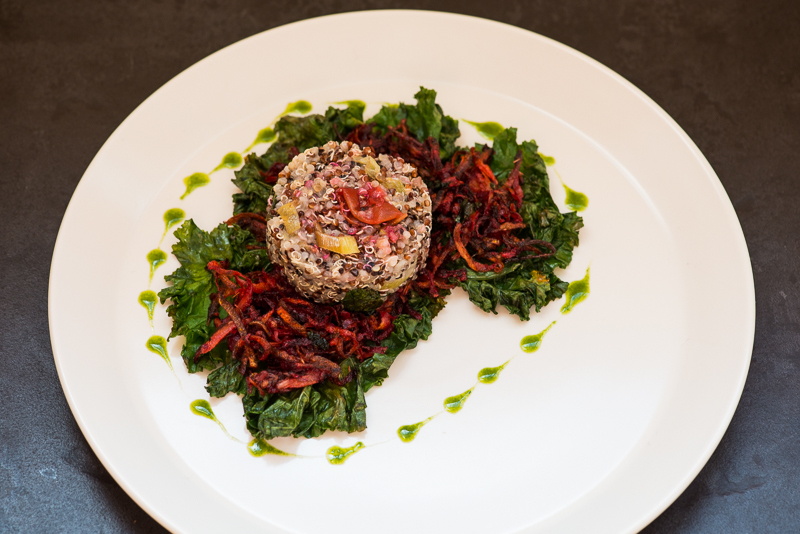 The Fruity Quinoa Rice is really the most important part of this dish. 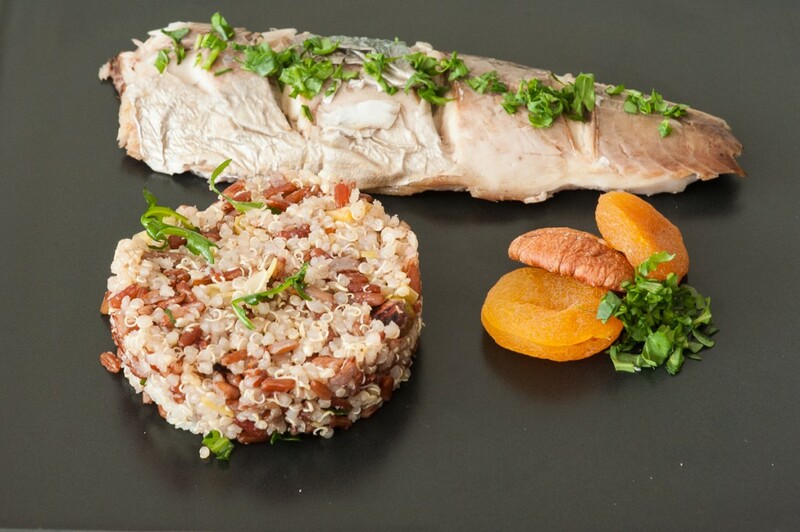 Instead of serving mackerel with it, you can choose chicken or some smoked fish if you prefer. Any leftover rice will be delicious the next day, refreshed with some sautéed portobello mushrooms, some pieces of chorizo and, maybe, some paprika powder too. Shell the pistachio nuts and dry fry all the nuts in a pan. Cut the apricots into smaller pieces. Cut the rocket salad finely. Cook the quinoa a few minutes less than the instructions on package indicate. Cook the rice in vegetable bouillon a few minutes less than the package instructions indicate. In a large pan, fry the leek and garlic in some oil. Add the cooked quinoa and rice. Sautee a few minutes. Drizzle some olive oil on top. Add the vinegar and salt and pepper. Taste. Season some more. Mix in the nuts and apricots. Stir in the rocket salad. Score the back of the mackerel in 3-4 places and the coat the fish with olive oil and salt. Great lamb dish, full of flavour. Low fodmap recipe. Sesame seeds for adding towards end of frying. Combine the marinade and pour over the lamb. Refrigerate for 1-2 hours. Prepare the quinoa dressing and set aside. Prepare the salad. Season and add the lemon juice. Set aside a minimum of 20 minutes. Rinse the quinoa and boil according to the instructions on the package. Prepare the orange by cutting off the peel (all the white membrane too), then, using a sharp knife, cut each segment just inside the thin white membrane, thus fully removing the membrane. Cut the remaining flesh into smaller pieces. Heat oil in a sauté pan. Fry the lamb steaks a few minutes on each side (depending on thickness of the cut). Remove from pan, roll in sesame seeds and then fry on a lower heat another minute. Leave the meat to rest 4-5 minutes. Drain the cooked quinoa, stir in the spinach, water chestnuts, the orange and chopped chili. Pour the dressing on top. A light, dairy free (if you take out the Parmesan cheese in the patties), festive meal. Since a lot of it may be prepared in advance, it makes for a good Friday dinner when you don’t have a lot of time to spend in the kitchen. Boil the quinoa according to directions on package. Usually about 20 minutes. Do not undercook. Better to add 5-8 minutes on the cooking time. Add whisked eggs, Tabasco, cheese and Chia seeds. Let stand at least 30 minutes to allow the Chia seeds to swell. Over moderate heat, fry the quinoa in small round shapes. Not too thick nor too large, otherwise too difficult to flip. They are rather brittle. If using more cheese they will be sturdier. Fry for 8 minutes per side, until coloured. Can be made in advance and then reheated in a frying pan. Place the chicken pieces in greased, ovenproof dish. Season with salt and pepper. In a deep pan, over medium heat, fry the vegetables until soft. Then add remaining ingredients (except the olives) and simmer for 15 minutes. Stir in the olives. Pour over chicken and place in oven for 40 minutes. Place 2 patties per plate, slightly on top of each other. Using a ring mold, spoon the casserole into a circle and drizzle some sauce around it. Add the chopped parsley and the carrot swirls. This fantastic casserole I’ve found in a magazine and now love to cook with very few adjustments. 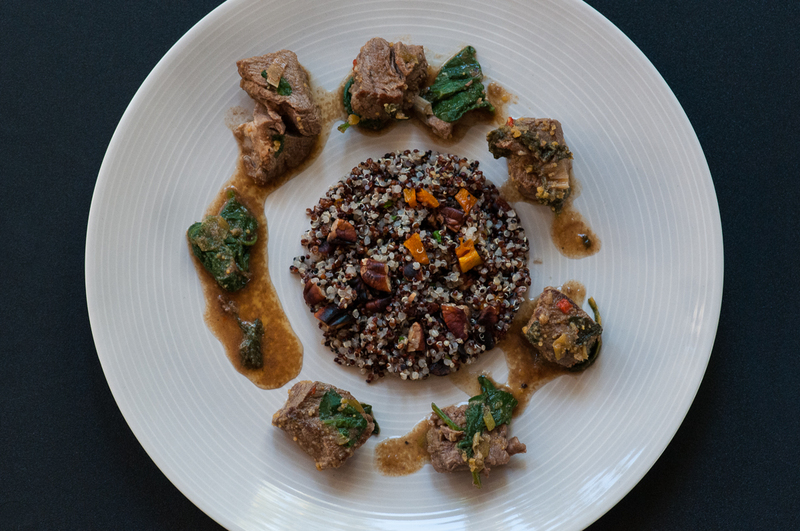 The nutty fruity quinoa goes well with the many spicy flavours of the casserole. Take care with the chili and the red curry paste as to not make it too spicy. I usually remove the seeds of the chili, taste a small piece of the flesh and then decide if I can use all or just part of it. Tasting and adjusting the seasoning is key when making a casserole. Simmer for 10 minutes. Remove the cinnamon stalk. Add the spinach, heat until wilted. Cook the quinoa in the broth according to directions of the package. Add the mango and pecan pices. 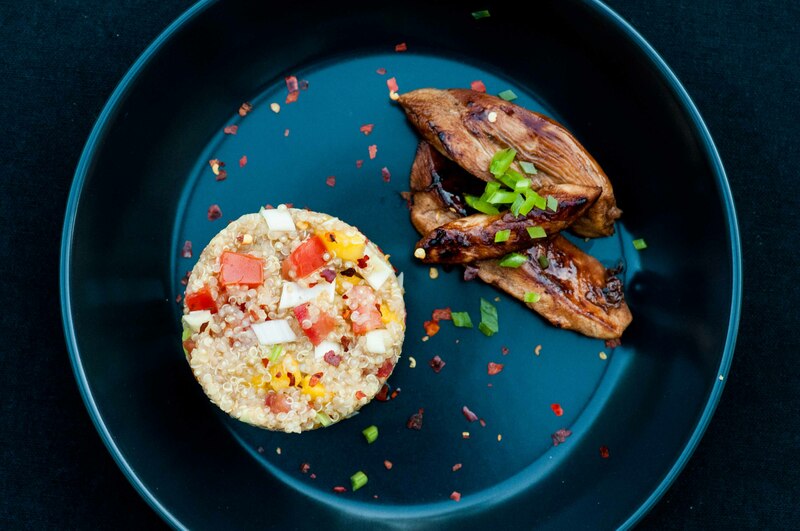 The soy sauce creates a quite salty chicken dish which is really delicious together with the fruity quinoa. Perfect on a hot summer day! Gently sauté the chicken in the oil, while saving the marinade for later. When the chicken is browned, add the marinade and let simmer until done. 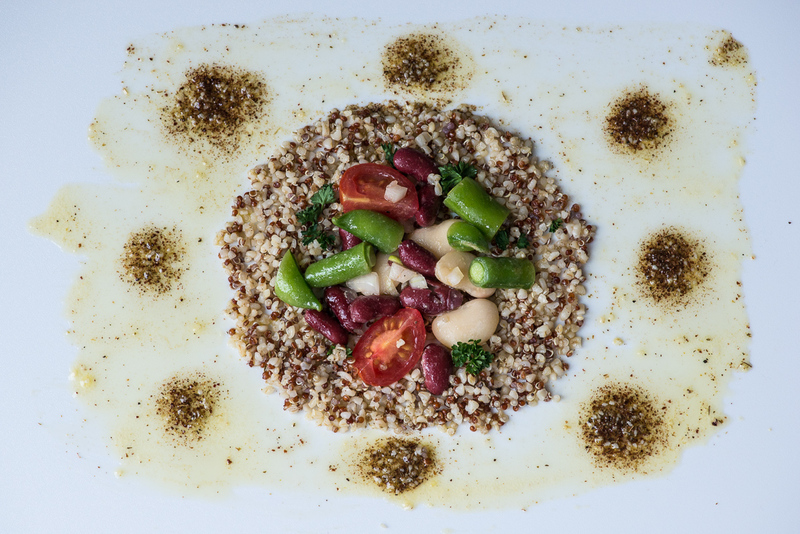 When done, combine the oil and vinegar with the Quinoa in a bowl. 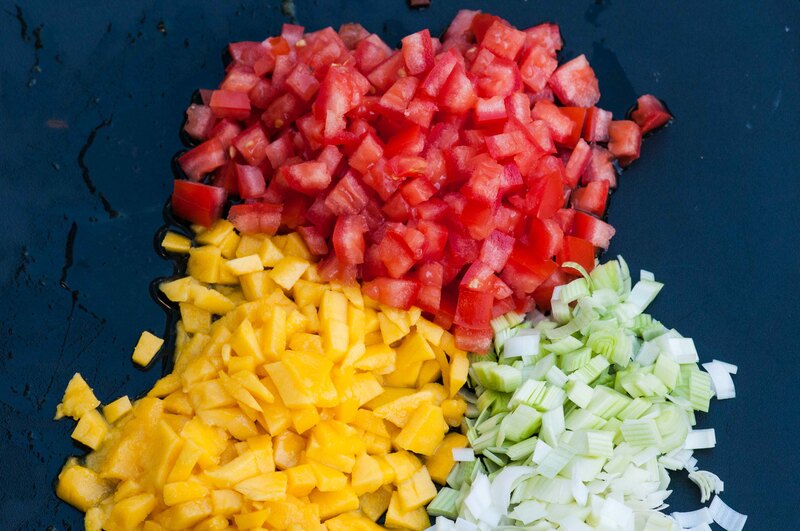 Add the finely diced vegetables and fruit and season with salt and pepper. 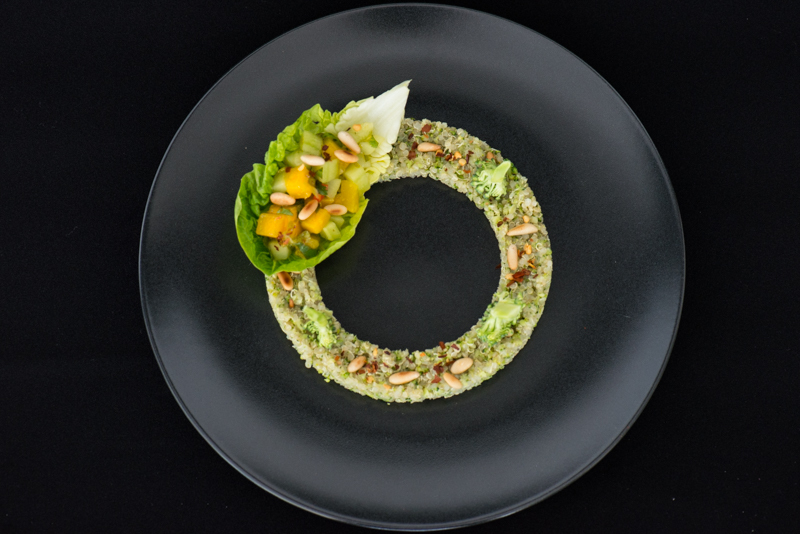 Using ring molds, arrange the quinoa on serving plates and sprinkle with chilli flakes. Add the chicken with some finely chopped green pepper on top. This Morocco-inspired meal will please everyone at the table, and much of it can be prepared a day ahead! 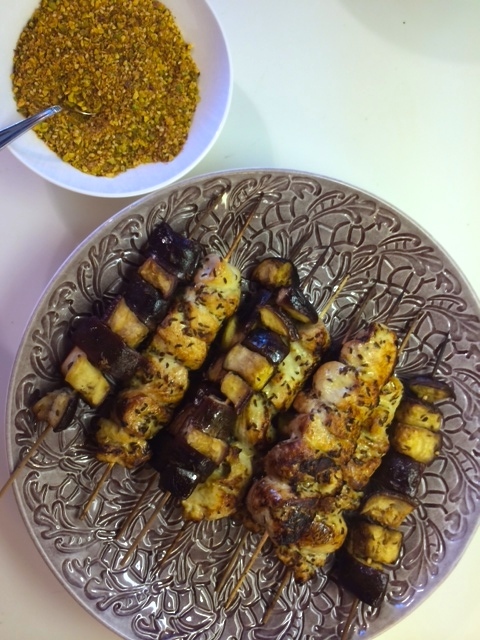 Roll the sticky skewers in the dukkah for the perfect taste sensation! 1. Mix the ingredients to the marinade and divide between two bowls. Add the chicken and aubergine to the bowls and let marinade in the fridge for 24 hours. 2. To make the dukkah roast sesame seeds, cumin seeds and coriander seeds in a dry pan until they start giving off a scent. In the meantime, mix the pistachios until coarsely ground and add to a bowl. Mix the roasted seeds in the mixer and add to the pistachios. Incorporate the rest of the spices and mix well. 3. Boil the quinoa according to instructions on the package. Zest 2 of the oranges and peel to cut segments of the flesh. Keep the juice that forms. 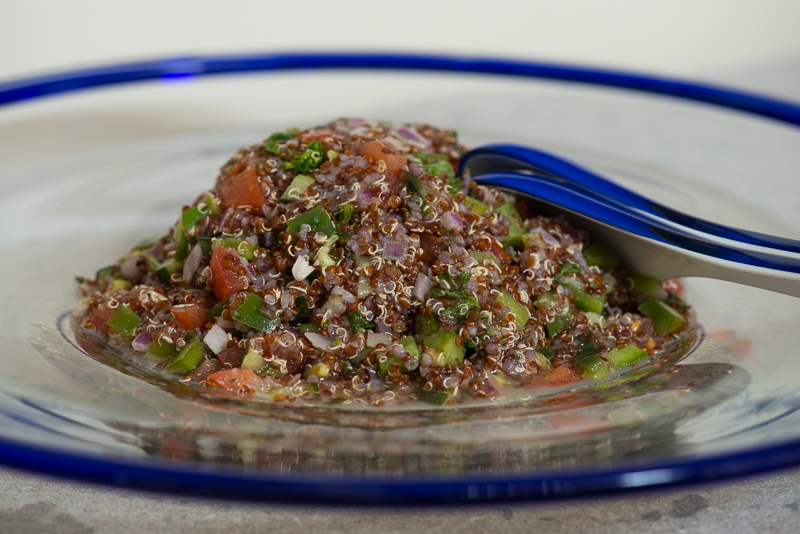 Mix quinoa with orange juice and zest, lemon juice and zest, olive oil, harissa and spices. Let cool. Until here you can prepare a day in ahead. 4. Soak the wooden skewers in warm water for 20 minutes. Heat the oven to 220 degrees. Add the chicken and the aubergines to the skewers separately. Bake the aubergine skewers in the oven for 30 minutes, turning them around after half the time. Pan fry the chicken skewers to give colour on all sides, then add to the tray in the oven during the last 5-10 minutes. 5. Add the remaining ingredients to the sallad including the segmented oranges and mix. 6. 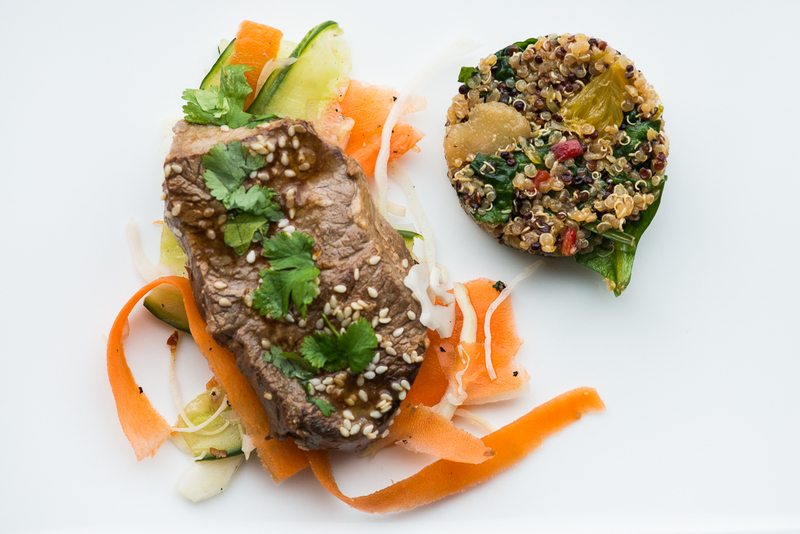 Serve the sallad room tempered and the skewers with the dukkah to sprinkle generously on top. A wonderful alternative to risotto. This dish is creamy, yet light. 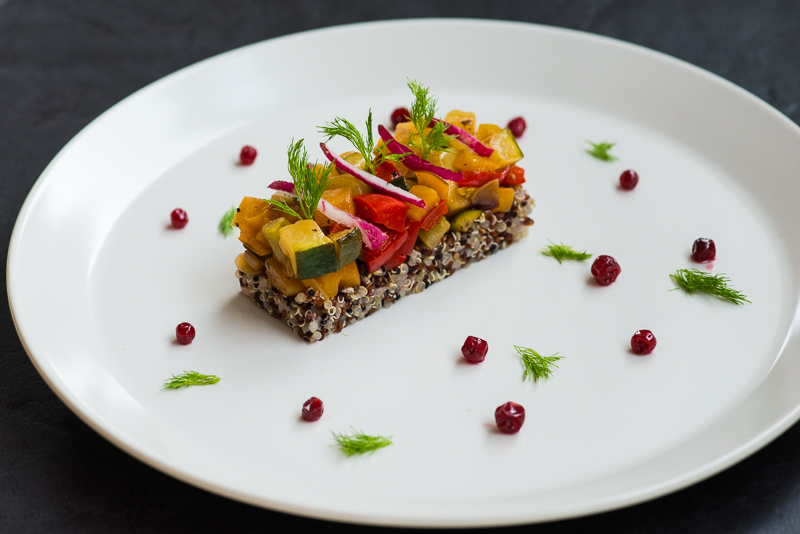 I prefer using the white quinoa since, although colourful and beautiful, the black and red versions can be perceived as a bit hard in texture. Boil the quinoa (in chicken broth) according to the instructions on the package. Set aside. Sauté the onion over medium heat, then add the pancetta and sauté another couple of minutes. Add the garlic and saffron and then the mushrooms. Cook until most of the water (from the mushrooms) have evaporated, about 5-6 minutes. Pour the wine into the mixture and cook for a few minutes. Then add the cream and let simmer for another few minutes. Add the cooked quinoa and reheat while stirring. Add the parmesan cheese and gently fold in the seafood, saving a few pieces for the garnish. Carefully stir for a few minutes to heat through. 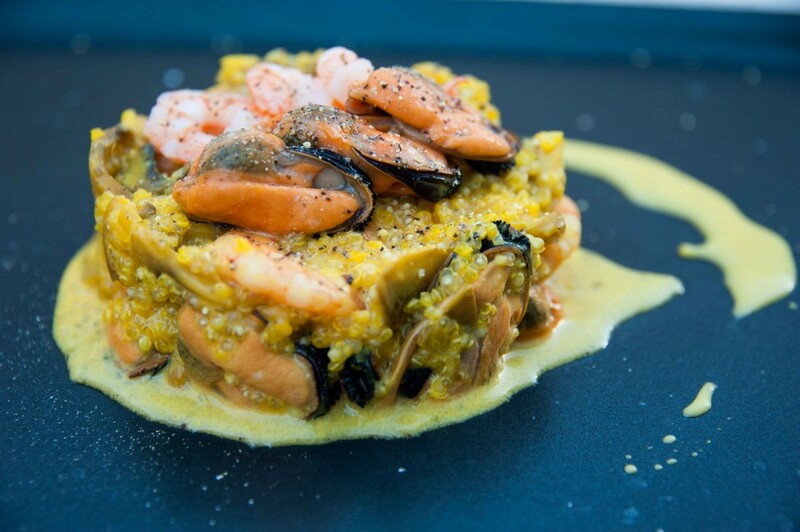 Serve on individual plates (in ring molds) and add a few pieces of seafood on top. Finish by sprinkling some black pepper over the dish.